With the help of millennial marketing expert Tony Chapman, food-service franchise system A&W interviewed young consumers to learn how they think and found three key trends. First, millennials want more taste, value and fresh options. They do not want meat with antibiotics, steroids and hormones. A&W was the first quick-service restaurant (QSR) in North America to introduce beef raised without the use of hormones and steroids, chicken raised without the use of antibiotics and eggs from hens fed a vegetarian diet with no animal by-products. Secondly, millennials care about the supply chain and how their food gets to them. They have a desire for ethically sourced food from sustainable farms and companies. A&W works with potato farmers from Taber, Alta., Van Houtte organic coffee roasters and ranchers committed to raising cattle with care and awareness of the environment. The company also uses washable, reusable glassware, plates and cutlery for its dine-in customers, which cut down on waste taken to landfills each year. Lastly, millennials have an entrepreneurial spirit, want to be self-made and feel corporations do not have consumers’ best interests at heart. 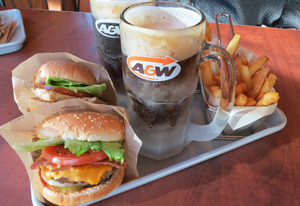 A&W is currently finalizing a new low-equity franchise model with a goal to connect with a younger demographic of 25-to 35-year-olds.